Do you have parcels to send this Christmas? If you want to make sure they arrive safely, follow our tips for perfect packing. Don’t overload: if you’re sending big or heavy gifts don’t overload your boxes – many carriers have a maximum weight per box of 30kg. Lower weight boxes means there’s less chance of your packages being heavily handled too (or dropped!). Heavy boxes should be sealed with fabric tape rather than brown tape for maximum security in transit. Pack it in: allow at least two inches of packaging around breakable or fragile gifts. And don’t rely on shredded or torn up newspaper – use polystyrene peanuts and bubble wrap. Box clever: use a big enough box – this will also help to stop you skimping on internal packaging. Choose from a range of single and double-wall boxes from Mail Boxes Etc. – we have sizes available to suit every need, and can also create custom-made boxes for outsized or awkwardly shaped items. Spread the load: if you’re sending several items to the same address, spread out any valuable items across a number of packages, instead of putting all of them in the same carton. Cut it fine: place some scrap cardboard under the final seal of each box so that, when the knife cuts in to open the box upon delivery, it doesn’t damage the contents. Seal the edges too – this adds stability and reduces the risk of snagging and tampering. When in doubt call Mail Boxes Etc. 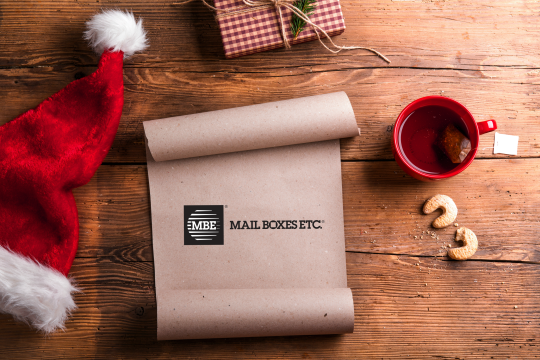 on 0800 623 123 or visit www.mbe.co.uk to find the location of your nearest store, where you’ll find friendly advice and expert packing services, as well as all the packaging materials you need.